Hello everyone! 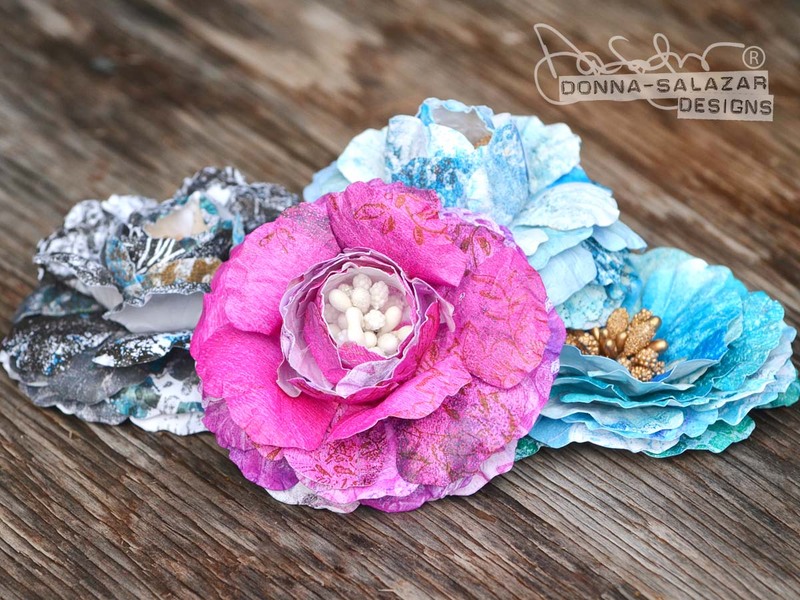 Donna Salazar here with a quick tutorial for making gorgeous paper flowers using my Jumbo Rose Contour™ Steel Rule Die. 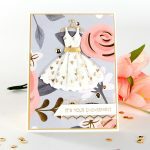 I designed this die to compliment one of the very first die sets I created for Spellbinders back in 2010. 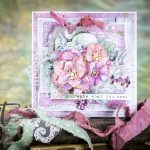 This die set is called S5-050 Rose Creations Etched Die Set and, to this day, it is still one of my all time favorites. It includes six flower dies and three leaf dies. 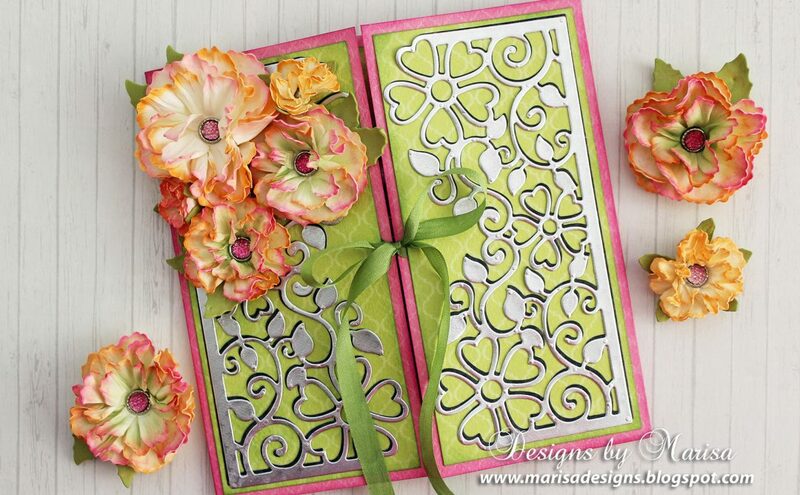 My NEW Jumbo Rose Contour™ Steel Rule Die has two flowers and two leaves shapes. The smaller flower is the same size as the largest flower in the Rose Creations Set and the second flower is even larger. 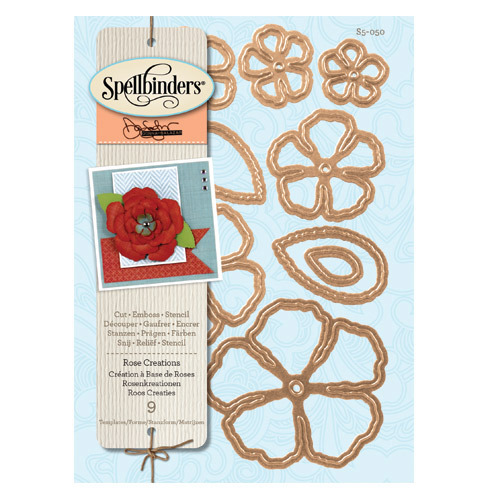 The Jumbo Rose Contour™ Steel Rule Die make this an ideal addition to the Rose Creations Set because now you can die cut flowers out of materials other than paper. For me, DENIM (one of the my favorite materials!) but also cardboard, felt and even leather. This makes creating my hair flowers easy peasy lemon squeezy! 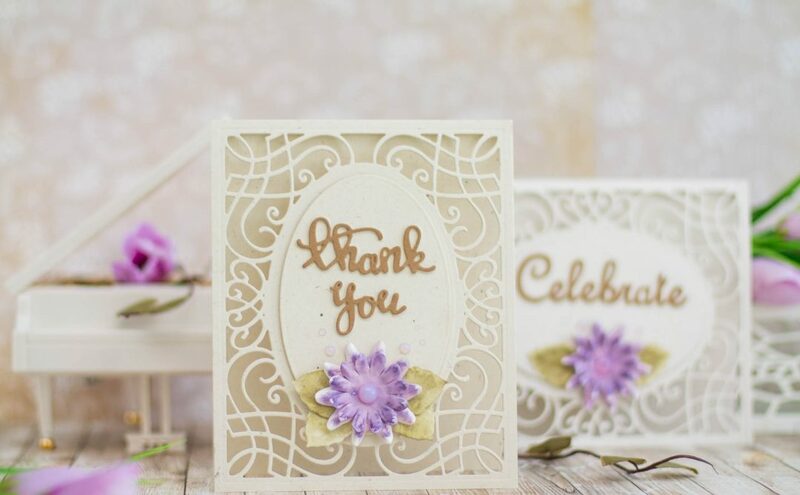 I used only the Jumbo Rose die to create the flowers for this tutorial. 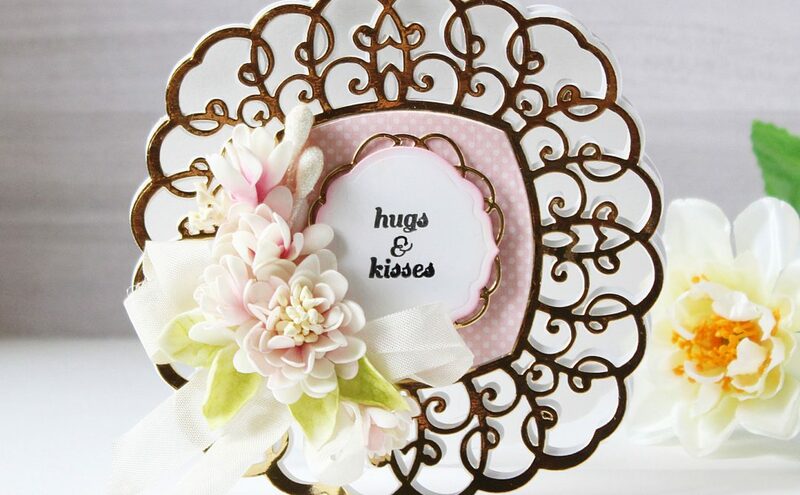 The paper used to die-cut with was created by printing with Gel Press plates. I started making my own monoprinted papers with these plates (If you haven’t tried the Gel Press, I’ll warn you now, it is very addicting). The steel rule die can cut through 7-10 layers of these papers at once so I cut through stacks and stacks of these babies…lol! For my example flower I chose several that were similar in color. I chose 5 of the larger flower and 3 of the smaller flower. 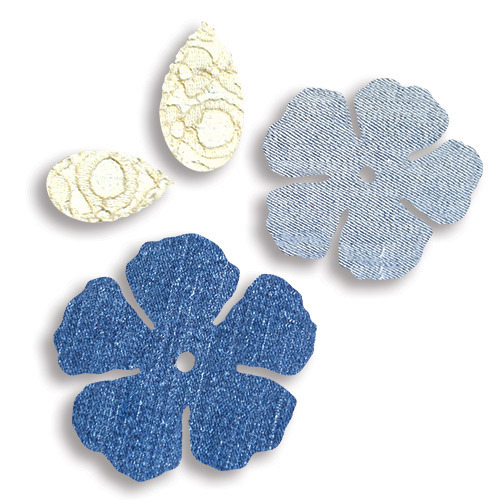 On both flower sizes you can see a couple flowers where I used the Embroidered Flowers stamp from my Embroidered Flowers Stamp and Die Set by stamping on the Gel Press plates. I used the Tool ‘n One™ to cup every petal. 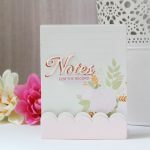 I added some strong double sided adhesive (E-Z Runner Ultra from Scrapbook Adhesives by 3L®) around the center hole of each of the larger flowers. I adhered the layers together with the petals offset. I added the same adhesive to the back of each of the smaller flowers. I adhered the layers together with the petals offset and added some flower stamens through the center hole. I used the same adhesive on the corners of the first flower layer (one at a time) and adhered the petals so that they were overlapped to create the center bud. The photo below is what the first flower layer should look like. For the second flower layer I added the adhesive on each petal only at the base (nearest the center). I folded each petal up and pressed the adhesive into the flower bud center. I then added adhesive to the tips of each of the petals on the last flower layer. I folded each petal into the center bud and the final result was the photo below. I then pushed the stems from the flower stamens through the center hole of the larger flowers. I added more adhesive to the center of the petals of the first layer of the larger flowers. I pressed the first layer of the larger flowers into the base of the flower bud center and the result is the flower in the photo below. I used the same techniques to make the additional flowers in the photo below. Since I LOOOOOVED the way these flowers turned out AND the photo that I took of them, I made it into a desktop wallpaper and thought I’d share… ENJOY!!! Miscellaneous colors and brands of acrylic paint. Awesome! 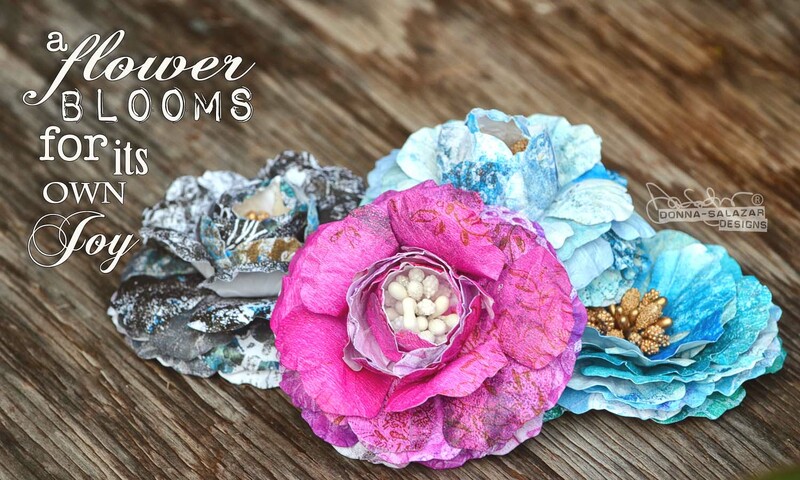 Thanks for sharing how you made these gorgeous flowers!